Tasty Red Snapper Salad Meal! Sautéed the night before, this gently re-warmed turmeric-ginger red snapper fillet is combined with a half-plate of arugula, splintered celery bits, quartered grape tomatoes, and a melange of kiwi and orange pieces. It’s garnished with a scattering of pistachios and anise seeds, diced fresh ginger, parsley, paprika, and black pepper. Yummy and only about five minutes from first touch of the refrigerator door to ready to eat! Learn more about creating naturally delicious and optimally nutritious meals through OurPlate, HumanaNatura’s new healthy eating aid, and experience how this simple, science-based, and 100% natural approach to daily meals can change the way you eat, feel, and live. Perfect your skills at making delicious and naturally healthy salad meals that follow the OurPlate guidelines via the Meals tab above, our popular article Perfect Salad Meals, or the Natural Eating section of our comprehensive Personal Health Program. Do you marvel at the new internet-enabled social networks we all now have, or at least all now can have? And do you feel that your network, electronic or otherwise, reflects conscious decisions and preferences on your part? A new study of modern-day hunter-gatherers by Harvard University and The University of California encourages a broader view on both points. It suggests: 1) that modern-day online social networks are more closely linked to earlier natural human social dynamics than we may realize, and 2) that our personal social networking preferences may be much more predictable than we believe. The new study examines how human social networks are structured in our natural hunter-gatherer setting, focusing on how people with varying propensities for cooperation and individualism naturally mix and adjust to one another. This structuring of high and low cooperators is important, since in a predominantly cooperative species like Homo sapiens, incentives naturally exist for people who are more self-interested to take advantage of our generally cooperative social setting. But highly individualistic “free-riders” must be naturally limited and made exceptional, since excessive or normalized individualism risks threatening essential cooperation and the entire society. This problem has been with us since the beginning of social life itself, and remains one of the most important social policy issues today. A beautiful, slightly exotic, and optimally healthy salad meal made in about 15 minutes. It features a ginger-tarragon stir-fry of sliced pork, squid, scallops, shrimp, and red onion, along with a melange of mandarin orange and berries, and a half-plate of raw veggies – including mixed greens, splintered celery pieces, diced cucumber, and quartered grape tomatoes. This wonderful mix of natural foods and flavors is garnished with a scattering of pistachios, parsley, coriander, and black pepper. Enjoy – we did! Learn more about creating naturally delicious and optimally nutritious meals through OurPlate, HumanaNatura’s new healthy eating campaign, and experience how this simple, science-based, and 100% natural approach to daily meals can change the way you eat, feel, and live. Perfect your skills at making delicious and naturally healthy salad meals that follow the OurPlate guidelines via the Meals tab above, our popular article Perfect Salad Meals, or the Natural Eating section of our comprehensive Personal Health Program. Enjoy a Cajun Fish-Fry Salad! Don’t let a fear of health risks from fried foods keep you from enjoying lightly-sautéed fish and other natural proteins. A just out University of Madrid study confirms what many of us have found through years of Natural Eating and healthy blood lipid profiles: oil quality matters as much or more than oil quantity! This healthy Cajun fish salad meal follows HumanaNatura’s OurPlate guidelines and scores a perfect 10 via our quick and easy OurPlate Meal Rating System. Made in minutes, the salad meal features sautéed white fish and red onion with herbs and a shot of cayenne pepper, a cool melange of diced kiwi and blueberries, and a half-plate of mixed greens with cut cherry tomatoes and diced cucumber. It’s all garnished with pistachios, parsley, paprika, coriander, a generous amount of anise, and just a bit of black pepper. Good! 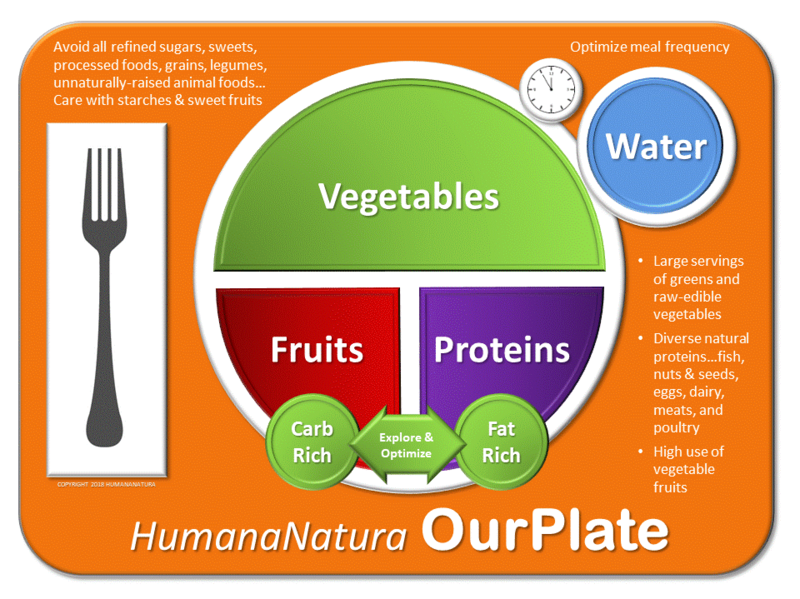 Learn about OurPlate, HumanaNatura’s innovative healthy eating guide! HumanaNatura created and advocates the OurPlate healthy eating model, and maybe this is not the finest specimen of the U.S. government’s MyPlate dietary approach in action. But the photo on the left is an actual example of the MyPlate approach being demonstrated by government officials. Anyone want a bite of the semi-scary, what-were-they-thinking, and school cafeteria-inspired MyPlate meal, rather than the renaturalized and easily prepared HumanaNatura OurPlate sample we have put up alongside it? And does anyone think that the MyPlate example is nutritionally superior, in any manner or form, to the healthy-just-to-look-at HumanaNatura OurPlate Salad Meal we have shown on the right? Click to learn how to quickly score meals using the OurPlate Meal Rating Guide. If you are thinking rematch, we would point out that even world-class master chefs using the governmental MyPlate model are going to begin from a significant disadvantage, relative to HumanaNatura’s OurPlate approach. Specifically, they will be forced to include unnatural, health-limiting, and ecologically harmful monocrop foods like grains and cereals. They will need to make way for tissue-inflaming and hormone-imbalancing beans and legumes. And they will be required to take away crucial space for health-essential, fiber and micro-nutrient rich, and microbiome-supporting greens and vegetables. Though we have little doubt that a good chef could make a tasty meal with less healthy and less natural MyPlate foods, the result of eating this way, today and over time, is far less appetizing – reliably lowering our natural fitness, increasing risks of chronic health problems, promoting premature tissue degeneration and aging, and steadily undermining the natural environment upon which we all depend. By contrast, making attractive, delicious, optimally healthy, and ecologically sustainable HumanaNatura OurPlate meals can be done by anyone, quickly and easily, and requires no special culinary skills. Learn more about creating naturally delicious and optimally nutritious meals through OurPlate, HumanaNatura’s healthy eating guide, and experience how this simple, science-based, and 100% natural approach to our daily meals can change the way you eat, feel, and live. Then, perfect your skills at making delicious and naturally healthy Salad Meals that follow the OurPlate guidelines via the Eating tab above, our popular article Perfect Salad Meals, or the Natural Eating section of HumanaNatura’s comprehensive Personal Health Program. Once you have begun eating the HumanaNatura way, we hope you will explore your many opportunities for new, more natural, and healthier modern life between meals – through HumanaNatura’s four-part system for lifelong and lifewide health and fitness at HumanaNatura Overview. Welcome to HumanaNatura’s OurPlate healthy eating guide! OurPlate is a simple but powerful graphical aid to promote more natural and optimal modern eating. OurPlate is based on contemporary nutritional, agricultural, and ecological science, and also uses research into our original human eating patterns in nature. In practice, OurPlate helps us first to better understand and visualize ideal modern eating, and then to create meals that are naturally delicious, easy to prepare, and optimally healthy – for us and for our planet. The name, OurPlate, was chosen for contrast with, and to highlight serious flaws in, the U.S. government’s heavily promoted MyPlate nutritional model. The names may seem similar, but the two dietary approaches are quite different – in their underlying principles and recommended practices, in the breadth and depth of science employed, and in their expected personal and environmental health impacts. Crucially, the governmental MyPlate model proposes only minor adjustments in the way people generally eat today, and therefore only modest changes in how food is typically consumed and produced. Because of this, adoption and promotion of the MyPlate approach can be expected to produce little or only incremental improvements in our health levels, except in cases of people with very poor diets. MyPlate may be good for established agricultural and food industry interests, but it is far from ideal for nearly everyone else and the larger environment on which we all depend. By contrast, HumanaNatura’s OurPlate dietary guide proposes a very different, far more natural, more informed, and reliably more health-transforming approach to modern eating. When adopted, the OurPlate guide normally produces rapid and sometimes startling improvements in our personal health, even for people who have average or above average diets today, while fostering modern eating patterns that are readily made fully sustainable ecologically. To correct essential errors in the governmental MyPlate approach – and in many other modern dietary guidelines, programs, and principles – OurPlate is a 100% science-based, clean-slate, and health-centered model for optimal modern eating. At the same time, OurPlate has been designed to make modern Natural Eating simple, easy to understand and explore, and an enjoyable and welcome part of our modern daily lives. In practice, not only does OurPlate produce superior personal and environmental health, it is the foundation for naturally healthy meals that are quick to make, and a joy to eat and serve. Explore the Natural Power of OurPlate Today! Learn more about preparing delicious OurPlate meals and HumanaNatura’s overall food guidelines via our regular example meal posts, and explore HumanaNatura’s detailed nutritional summary and guidelines via the Natural Eating section of our Personal Health Program. As you will quickly see in practice, the OurPlate healthy eating guide and HumanaNatura’s larger technique of Natural Eating form a powerful, renaturalizing, and revolutionary approach for modern eating. Using OurPlate and our Natural Eating guidelines, even for a few weeks, you will soon find that OurPlate and HumanaNatura do indeed offer a new, simple, natural, and health-transforming way to organize both our daily meals and lifelong eating patterns. Then, as you achieve new personal health, fitness, and well-being from HumanaNatura’s Natural Eating practices, you can explore the other techniques of our four-part natural health system – Natural Exercise, Natural Living, and Natural Communities.